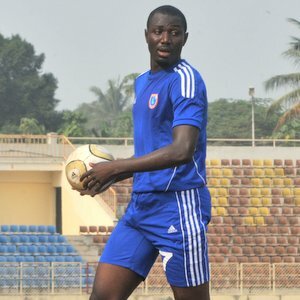 Ede made a goalscoring debut for Rangers when they won 3-0 against Gombe United FC on 29.04.2012. Ofoedu was also on the scoresheet, scoring his ninth league goal of the season, making him joint top scorer in the Nigeria Premier League 2012 together with youngster Mustapha Babadidi of Gombe United FC. Babadidi has been struggling with injury for the last couple of weeks. Hard-working striker Efe Yarhere scored the third goal of the match, also his third goal of the season. * Right-winger Chinonso Okonkwo of Enyimba FC and the already mentioned Ofoedu will be strong candidates for the “Newcomer of the season-award” as both players are enjoying their first ever season at top level of Nigerian football. Okonkwo was signed from second level side First Bank FC before the season and his performances have been spectacular. Okonkwo is one of the quickest players at the club and has excellent dribbling skills. Okonkwo, who can also play as a striker, has scored four goals so far this season. * I only recently found out that Enyimba FC has signed Paul Onobi (born 27.12.1992), formerly of Warri Wolves FC and Niger Tornadoes FC. * In Stanley Dimgba, Kwara United FC has made one of the best signings of the mid-season transfer window. Dimgba, primarily a left-winger, was one of the bright spots at Plateau United FC last season, scoring twice for the relegated side. According to some sources, Dimgba scored on his debut for Kwara United FC on 28.04.2012 against Wikki Tourists FC. Other sources claim the goal was an own goal scored by Wikki’s brilliant captain Mustapha Ibrahim. Defender Ibrahim and strikers Alaba Johnson and Abubakar Umar are three players to look out for at Wikki Tourists FC. * Akwa United FC, currently number six in the league, has been the surprise package so far this season. The club has several quality players, including goalkeeper Olufemi Thomas (born 05.08.1989), central defender Monday Osagie (born 31.12.1989), defensive midfielder Solomon Jabason and versatile attacker Ini Akpan. As far as I know, these four players have been essential to the success of the team. The picture is of Solomon Jabason and is taken from SuperSport. * Watch out for Fuad Ekelojuoti at Ocean Boys FC. The attacking midfielder is one of several young, promising players signed by the struggling club during the mid-season transfer window. * I have previously written about Moses Bunde of Lobi Stars FC and described him as a striker. As far as I know, Bunde has lately been used as a central defender – with great success. As far as I know, Bunde has yet to turn 20 and he is definitely a wonderful talent. * After a somewhat shaky start, goalkeeper Dele Ajiboye (born 07.08.1990) is now the established number one goalkeeper at Shooting Stars FC. Ajiboye, who made one appearance for Pontevedra CF, a Spanish third level side, during 2010-2011, has played several impressive matches for 3SC this season. * I believe Kaduna United FC has signed right-winger Ndubuisi Nkoro, formerly of Heartland FC. Nkoro will bring valuable experience to the young side. * Attacking midfielder Abdullahi Shehu has been a revelation for Kano Pillars FC. Shehu, who was recently named in the squad of the Nigeria U-20 national football team, joined Pillars from Plateau United FC before the season. * Right-winger Gomo Onduku of Sharks FC is currently in top form, having scored four league goals during March and April 2012. * Yesterday, central defender Shehu Majama’a (born 13.11.1989) of Wikki Tourists FC was named in the squad of the Nigeria B national football team. Hamza Ikenna Onwuemenyi (born 04.04.1988), who I believe is playing as a right-back for Akwa United FC, was a surprise inclusion in the squad. * It has been a rough season for Rising Stars FC, currently rock bottom in the league. However, several players can hold their heads high for the newly promoted side, including goalkeeper Moruf Olasupo, defender Adeniyi Adekunle, Clement Jonah Ayanfe, Philip Ede, captain Alaba Fadoju and top scorer Kayode Agboola (four goals). I won’t be surprised if some of these players sign a contract with bigger clubs during 2012. This is another super brat of this generation of football player, that still need attention and good luck to beacon to him, I’m kehinde Williams an ex-player in Nigeria and now player manager based in Lagos. I’m fortunate to be the first person to manage and transfer this guy to Julius Berger in 2008 soccer season. This is a guy i can vouch for, a great football player that need attention of our national team handlers.